In 1987, The Beatles' catalog was reissued on CD, much to the delight of the band. With this, they took their chance to standardize their catalog internationally, choosing to release the British version of their LPs on CD in every territory throughout the world -- all in mono. However, when these albums were originally released -- up until Sgt. Pepper- as was customary at the time, a different version was released in the U.S., stereo versions with different track orders, track listings, and presentation. This prompted quite the backlash from U.S. Beatles fans that grew up on the original versions. And even though they were different (and often sub par) to the U.K. versions, it didn't matter. They wanted the versions they grew up on. Enter The Capitol Albums: Volume 1. After years of going back and forth, Capitol finally decided to release the first four American albums -- Meet the Beatles!, Second Album, Something New, and Beatles '65. 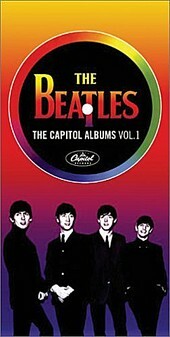 Released as a box set, Capitol has included both the stereo and mono versions of all four albums in this collection. And while the mono versions sound better (as they always have), American fans can rejoice, as they get to hear the mixes of the songs they grew up on, in better quality than they'll remember (they've been re-mastered for this collection). Still, it leaves you wanting to hear the mono versions re-mastered. After all, if you're re-mastering the American versions for better sound, why not the mono ones as well? But that's a different story, and this box set will excite and please. I'll give it an A.